It’s time to read the dam chapter. My hand closed around the little figurine that had cost her life. YOU TOOK THE FIGURINE THAT THE DUMP ROSE UP AND TRIED TO KILL YOU FOR?!? No wonder this book has the word “curse” in the title! You do NOT take the object from the land of cursed junk, especially when said land of cursed junk has already tried to stop you! Nothing good can come of this, kid! Have you not SEEN a horror movie? Hey, Percy! There’s a flesh-bound grimoire in the basement of the abandoned shack! Let’s go read it aloud! What could possibly happen?! …Okay, I feel better now. I wanted to believe that Bianca was still alive somewhere. But I had a bad feeling that she was gone for good. Here’s another dam question: How the heck did Bessie get all the way there from the Atlantic Ocean? Then again, I know so very little about cow-serpents. They may have powers of teleportation. Or flight. Or transwarp drive. One can never be sure, after all. Given that she’s appeared a second time, I’m starting to get the feeling she’s going to be playing more of a part later on. 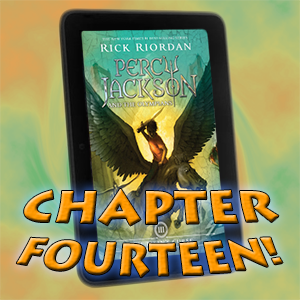 Maybe I’m over-using meta-knowledge, but Riordan could have had Percy notice the skeletons coming in some non-aquabovine-related way. Something’s DEFINITELY up with Rachel Elizabeth Dare, but I’ve no idea what it might be yet. I’m hoping that’s not the last we’ll see of her—it doesn’t seem like she’d just be a one-shot character—because I sense something interesting here, and I like her attitude. Strange last name she’s got, though. Thanks for reading my dam entry! Don’t forget to sign up for alerts when I publish a new blog post! Someone should make an RPG where cow-serpents are a playable race. I love the idea of a mythological creature having the powers of a transwarp drive!